I love the outdoors. I love fresh air. I love the smell of flowers. I love GREEN. When Neil and I began discussing the idea of moving to a European city, it was hard for me to imagine life in a city, especially with a dog. City life to me meant concrete (lots of it) with little patches of grass and few areas deemed “green”. There is Central Park in NYC, Balboa Park in San Diego, Luxembourg Garden in Paris, Hyde Park in London…the list goes on but usually, the amount of concrete in these cities, FAR exceeds the amount of green space. Fast forward to life in Budapest, the city called the Urban Jungle. I have never seen so much green space within a city, especially within the city center. Budapest provides locals and tourists with a variety of green spaces, nearly at every block or so. 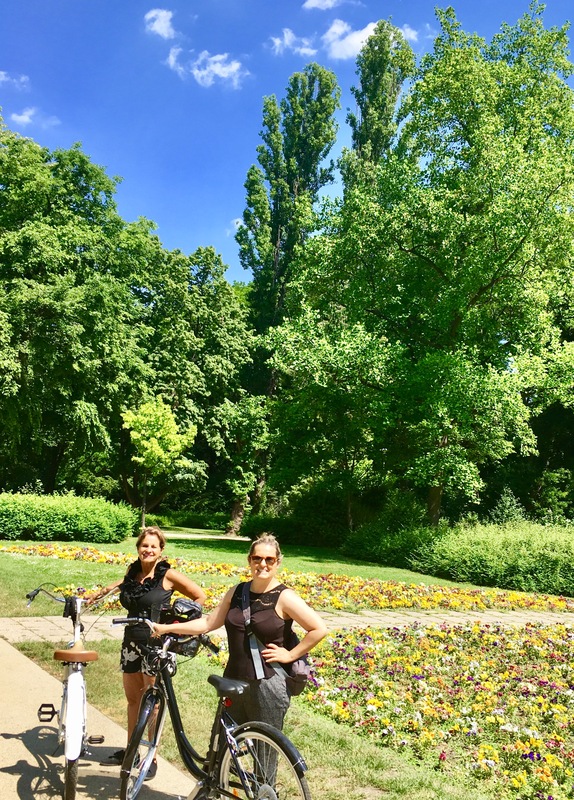 There are the large green spaces like City Park, Margit Island and Olympic Park but beyond the big green spaces, there are so many neighborhood parks that live alongside those that habit the city. Each park typically has a space for people to sit out and picnic, a space for children to play and meet others and most also have a dog park as well. Living in a “city” but being afforded so much green space as well is a dynamite combination for us, especially with our pup Lily. We can walk out our front door for the endless array of restaurants, coffee shops, gelato stands and grocery stores. Just as near, we can find all the green spaces we want and need. It is an unexpected, yet very welcome environment. It will be interesting to see this place in the winter when the “green” grass has died and is replaced by snow. Until then, I am making most of the days with green by being outdoors, biking, reading and more. We love reading your blogs Ashley! Budapest sounds like a beautiful city. The architecture and green spaces look awesome! We are very happy for you, Neil and Lily. Your Mom looks like she is having a blast! They are making progress on all our amenities here at LWN. We expect things to open in September. Many houses have completed construction…. 30 closed last month! Your house is looking good. We haven’t seen much of your renters. We did talk to them a couple of times. They seem very nice. Well keep up the blogs…. it is great reading about your experiences!